'The Arts of Japan' is the third in the 'Hanga Treasure Chest' print series from woodblock printmaker David Bull, following on from the production of the original series in 2005 and the 'Mystique of the Japanese Print' in 2010~2012. "During the course of the previous 'Mystique' series, we turned the Japanese traditional print to use in an investigation of its own history. This time, we are going to look around at the wider field of Japanese arts in general. And what a wonderfully wide field it is; there are few cultures on this planet that can boast of such a long and rich creative heritage! The people of these islands have been drawing ... carving ... painting ... cutting ... casting ... weaving ... and using any number of other techniques for creating beautiful objects for well over a thousand years, and the legacy of these centuries of activity is now so vast that it is difficult to know where to start! But start I will, and in each of the prints in this series I will provide an introduction to one particular theme - bringing you a woodblock print that illustrates it in some interesting way. Major fields such as pottery, sculpture, bonsai, architecture, flower arranging, and painting will of course be represented, but I intend to poke around in quiet corners too, to bring you some restrained surprises." Continuing from the previous Mystique series, these prints too will be in the traditional ko-ban size (13.5 x 20 cm - about 5 x 7 1/2 inches). Just as with all my print series, I am neither announcing nor displaying images of the prints that will be appearing in the set (most of them are indeed, yet to be decided). It's all part of the game - enjoying the surprise when you open the package and see for the first time the print that will be sharing your desk space for the next month. If that sounds just a bit too 'uncertain' for you, then please browse through some of my Surimono Albums, or indeed, the previous Mystique series; those should give you a pretty good idea of the sort of thing you can expect to see. The prints themselves are mounted on acid-free mat board, and each one is wrapped in a folder which carries a descriptive story. These of course fit into the tray of the storage case. 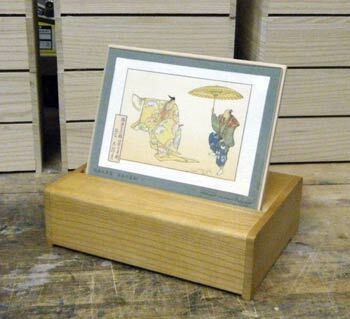 The display stand has an acrylic cover to protect the prints, and these components also tuck away for storage when the display is not in use. As each new print arrives through the course of the project, you put it up on the stand, and slide the previous one into storage inside the case. 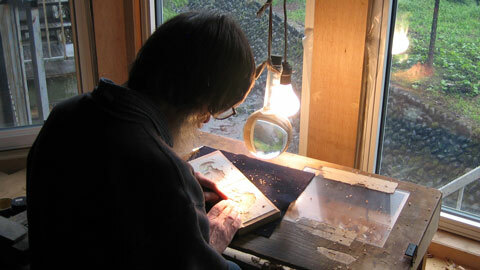 I do all the carving and printing work completely by myself (as has been the case with all my print series to date). When each batch is complete, I sign each print and stamp it with the baren embossment that has become my 'Studio Mark'. 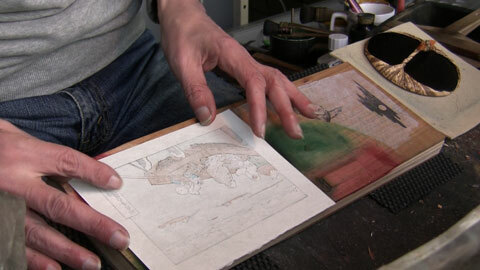 The prints will not be numbered, nor will the edition be artificially 'limited'. The series got under way in April 2012, and the first eight prints were issued at roughly six~eight week intervals. I then became rather 'side-tracked' with the initiation of my Mokuhankan print publishing venture (becoming a publisher, hiring young people to train as carvers and printers, and then opening a shop in Asakusa in Tokyo). I issued no prints for a period of around 4 years, and am now - here in early 2019 - only just getting started again. New subscribers have a few options: either take all the prints made to date in one batch, and then continue 'in step' with everybody else from here on, start at the beginning with the first one and go at the one-per-month pace on your own until your set is complete, or start at the beginning and take two-at-a-time to catch up faster. Subscriptions to this print series may be arranged as 'Gift Subscriptions'. The invoices go to you, but the prints go to a recipient of your choice. The usual way to arrange this is for you to prepare a message for the person, which I print out and enclose with the first shipment. 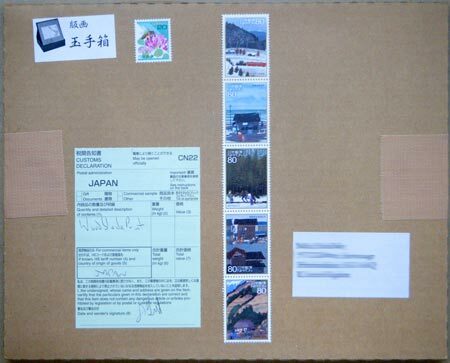 As an extra 'bonus', the postage on all the packages will be covered by using the newest issues of Japanese commemorative stamps (5~6 of them on each package), so not only will you be building a print collection, but a stamp collection as well! Beautiful prints ... interesting learning ... extra bonuses ... and all at a price that can't be beat. Please visit the Subscription Page, and put your name down for the Hanga Treasure Chest III : 'The Arts of Japan'! ... other parts are under a Creative Commons License.